and talent at the Forestburgh Cabaret has been established by the high level of performance over the fourteen weeks of this summer’s season. However, for the last show accompanying the main stage production of “The Chosen,” many, but fortunately not all, of this season’s ensemble members have packed up their ol’ kit bags and hit the road. Subsequently, last night’s performance was truly something to write home about. As fate would have it, a very talented, ballsey young theatre major at Wesleyan University was researching material for her senior theses project at the New York Public Library for Performing Arts at Lincoln Center. 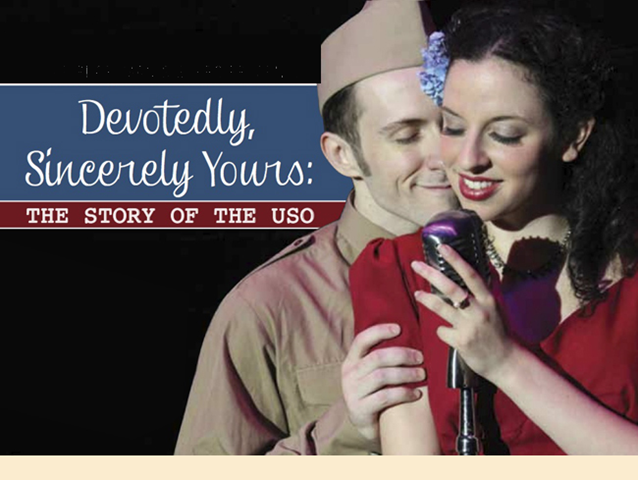 In the University’s achieves she found a seven page letter written during WWII by an otherwise unknown USO (United Service Organizations) entertainer, named Louise Buckley. The letter describes the dance halls, the music of the day and most importantly the relationship USO entertainers had with battle worn soldiers, sailors and Marines, as well as encounters with the young men about to ship out to unmentionable combat zones. During World War II, the USO became the G.I.’s “home away from home” and began a tradition of entertaining the troops that continues today. With her training and skills sharpened Samantha turned her pen to a full length musical play. For this week’s Cabaret at the Playhouse, she has trimmed it down to an immensely entertaining forty minute show. Not only is the first-hand material of this period historically germane, but as entertainment it’s worth a special trip to the Cabaret. To compose musical material for the stage is one daunting task, but to deliver is quite another. Fortunately, four of the top rated members of the Playhouse’s summer ensemble remain and are willing and superbly able to deliver quality entertainment. Trevor Pierce is the talented accompanist on the piano and as he’s demonstrated to audiences in the Cabaret and Main Stage throughout the summer, his technique and touch at the keyboard is completely in-tune with this USO Show. As the announcer and host of the USO sponsored radio broadcast, Calab Funk adds just the right amount of credibility to support the concept of a live radio broadcast. And what would a radio show be without signage, the type that instructs the audience, letting them know it’s time for applause. Enter, Chiara Trentalange an acclaimed Forestburgh veteran and graduate of Emersion College’s nationally acclaimed school of performing arts. As an actor, vocalist, dancer and team member, she has mastered her craft. Accompanying Chiara is Liane Zielinski. She’s is new to the Forestburgh ensemble this summer but has made her presence known with her superior dance and vocal attributes. These performers are a playwright’s prayer. They’re attractive, talented and able to complement Samantha as she excels, while delivering the USO featured entertainer, Louise Buckley, to an enthusiastic audience at the Forestburgh Cabaret.